The previous three years of Super Bowl half-time shows must have spoiled me. 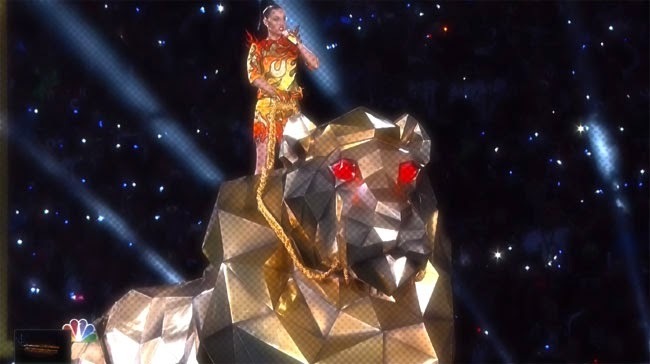 How else can I explain Katy Perry riding in to her half-time extravaganza atop a giant CAT not making her performance an immediate win for me. The reality was, though the Diva successfully recreated her own brand of cartoony pop on stage, she just wasn't delivering the energy or the "X-Factor" to really sell the whole experience to me. Now Missy Elliot, who joined Katy on stage for some reason, was a different story, serving me nothing but life and love for the music. That's not to say this was a bad showing from Katy, more so that it was lacking when compared to Madonna, Beyonce and Bruno Mars (which encompass the years I've given a hoot about the half-time show). Those individuals successfully created drama via their music first, and then complemented that with the visuals. The result were shows that sounded just as good in track only as they were to watch. The opposite holds true for Katy, with it sounding flat sans visuals. As a whole this felt more paint by numbers than any example of real artistry at work. And as such, it isn't even up there as one of my favorite performances from the Diva.